A year ago I was using beads to decorate a felt pouch I'd made and I was quite happy with a random arrangement of beads for the centre of a the flower . But after Christmas I found Beadlust the blogspot of Robin Atkins and that inspired me to try and do more with beads. 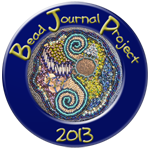 I loved the idea of 'The Bead Journal Project' and thought next year I'll join. Over the past year I have visited Beadlust and looked to see how participants projects have been going and out of the corner of my eye I would see Robin's mantra of -just do it. So today is the day I register for the 2013 BJP and I have started to set up my first blog to record how things go with the beading and any other things I might make as I'm fiddle faddling away with fleece, fibre and fabric. So what have I been doing with beads in 2012? Perhaps that will be for the next posts. Your blog is looking good Evanna. Love the colours in the first photo. Looking forward to finding out what your project for 2013 will be. Have fun! Thanks for your encouragement just what you need when your diving into something new. Well if this post doesn't totally make my day, I can't imagine what would!!! Keep just doing it!!! Your blog looks great... more just doing it, huh?! I look forward to getting to know you and seeing your beading/felting during the coming year!